The obsession for blitzing just about everything in a blender is a trend that doesn't seem likely to stop any time soon. And for a good reason, fruit and veggie smoothies and hot or cold soups are a great way to pack in at least a couple - if not all - of your "5 a Day" without having to eat a ginormous salad. 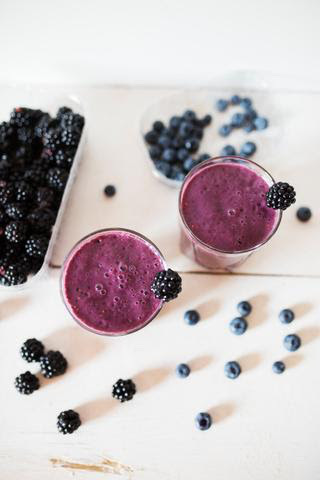 This simpler smoothie recipe is full of antioxidants from blackberries and blueberries, metabolism boosting matcha green tea powder, body, brain and gut healthy ginger, and all around good for you coconut oil. Throw in some low glycemic sweetener like monk fruit sugar and you've got a super healthy beverage your belly and body will thank you for! Puree ingredients in blender and process until smooth.